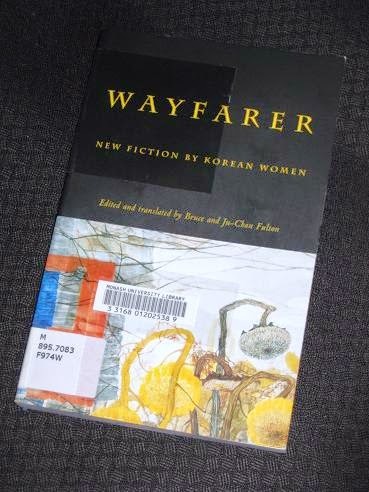 Wayfarer – New Fiction by Korean Women is a 1997 anthology from Women in Translation Press, edited and translated by (of course) Bruce and Ju-Chan Fulton. It introduces eight female writers from South Korea, each represented by one story. Originally released between 1974 and 1994, the stories are a representation of the influence female writers are having on Modern Korean Literature. The title comes from a story from O Chong-hui (and an excellent one it is too) about a woman trying to rejoin society after a traumatic incident. However, I won’t say too much about it here as it was one of the stories I featured in my post on the Modern Korean Fiction anthology earlier this year, and one that piqued my interest in female writers from the country. A shorter story is Kim Chi-won’s ‘Almaden’, which describes the life of a Korean woman at a bottle shop in New York. The story alternates between the dull description of her work routine and her fantasies of the rugged man who comes in every day for a bottle of cheap wine. Almaden (her name for the man, but actually the brand of wine he drinks) comes to be a symbol of escape from everyday life, representative of the life she’d like to lead if only she dared. These words start the story, taken from a sign near the Grand Canal, but they could just as easily refer to the man’s struggles to come to grips with the past. This one is a wonderful tale of men struggling to deal with women for who they are, a story with a nice (if fairly obvious) twist in the tail. There are more politics on show in Kim Min-suk’s ‘Scarlet Fingernails’. In this one, a woman gets to meet her father for the first time after he has spent decades in prison for being a suspected spy from the North. It’s an excellent story looking at the problem of guilt by association, an issue which was only recently resolved. Many of the family members resent the prisoner, not because of the years he’s spent away from them, but for the shadow he has nevertheless cast over their dreams and ambitions. You read it! Hooray! The more I look back on it, the more I feel like this was a much better introduction to Korean literature than any of the other books I've read recently. I'm glad to see it getting more attention.